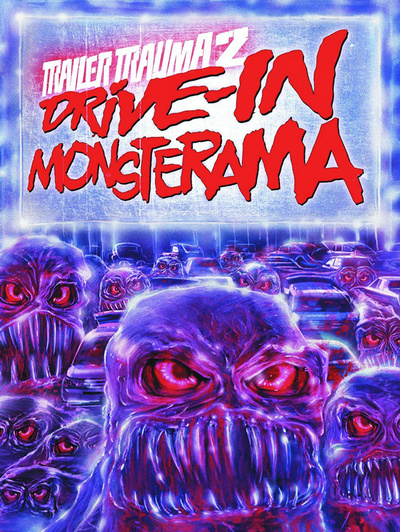 TRAILER TRAUMA was only the beginning – now you must prepare yourself as a fresh assault of gruesome ghouls leaps off of the screen and into the driver’s seat! 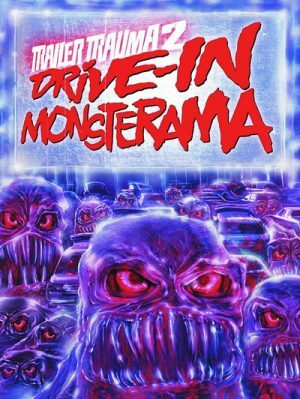 Return to the horrific heyday of drive-in theaters and dusk-till-dawn spook shows with TRAILER TRAUMA 2: DRIVE-IN MONSTERAMA, a celebration of psychotronic cinema and monster movie mayhem! If you're looking for star power, Trailer Trauma 2 showcases performances by the likes of Orson Welles, Burgess Meredith, Russ Tamblyn, Ernest Borgnine, Vincent Price, Jack Palance, Keir Dullea, John Huston, Christopher Walken, Anne Francis, Joseph Cotten, Shirley MacLaine, Alan Alda, Bette Davis, Oliver Reed, Udo Kier, Klaus Kinski (despite being credited as "Klaus Kinsky"), Ray Milland, Karen Black, Joan Collins, and Kim Novak. You can't swing a dead cat in this comp without whacking Peter Cushing or Christopher Lee. Sometimes both. The original Trailer Trauma strung together 64 vintage trailers and clocked in at two hours and seventeen minutes, all told. Trailer Trauma 2 ups the ante with nearly a hundred trailers -- right at 50% more! -- and a runtime approaching three and a half hours.